Kuala Lumpur, August 19, 2018 – Forget about the typical fashion show on the runway. How about arriving in style from the air and catch a glimpse of beautiful tropical floral fashion show like never before? “Fashion is in the air” is an innovative fashion show that defines new creative trend’s and a departure from the usual fashion runway. A rare showcase of fashion and beauties at the Grand Palace of the Golden Horses on August 19, the show is helmed by rising star in the fashion industry, Farel Mikhail Malaysia. The designers will arrive by helicopter and flanked with their muse, comprising members of Styleicon Prestige Beauty Queen. Apart from collaboration with Urban Box, Farel Mikhail also collaborates with Shinju Pearls for luxury accessories, BloomSkin for Skin Care, NottingHeels for footwear and First Time Around for customade handbags. “We want to promote Malaysia as a fashion hub for batik through this fashion show which features tropical flowers in modern kebaya-inspired designs. And this is the first time we do a fashion show with a grand appearance from the helicopter. We want this event to be memorable and make the Malaysian fashion industry merrier with amazing and creative ideas.” says Farel Mikhail. “We want to create a new Trend for Malaysia with using local batik as one of our basic design which wearable yet trendy inspired from our local traditional kebaya turn into fusion and modern looks. 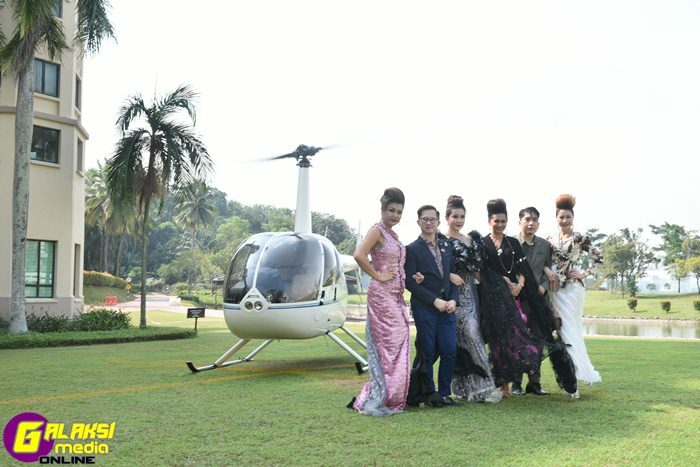 This Fashion Show with helicopter is a opening gimmick and is one of the first time ever in Malaysia.” says Jonathan. The entire show will be elegant and colourful with catwalk on the runway of the hotel lobby rather than the ballroom. The hotel guests together with over 100 invited guests will be able to catch a glimpse of this show. Farel Mikhail is a Malaysian fashion brand for over eight years. The founder, Farel himself is an award-winning designer, well-recognised in the fashion community. The brand made headlines in many fashion events, namely, Malaysia Fashion Week, Islamic Fashion Festival, KL International Hijab Fair, KL Fashion Week and many more. This is much attributed to his strong marketing partner, Jonathan, founder of Urban Box. It looks like Malaysia is set to soar in the fashion scene with more rising fashion designers who are risk-taker and think out-of-the-box. Farel Mikhail is Malaysia’s homegrown brand set to make waves in the international fashion scene. The brand made its debut in 2010 with menswear and soon, the founder, Farel Mikhail himself was awarded Best Menswear during Anugerah Bintang Popular Berita Harian 2012. With the increasing demands for urban stylish ladieswear and Muslimah fashion, Farel Mikhail forays into the women’s fashion with his trademark fashion of more curves for women of the new millennium. Since then, the brand has made headlines in Malaysia Fashion Week, Islamic Fashion Festival, KL International Hijab Fair, KL Fashion Week, Batik Fashion Show and many others. Farel also boosts his career with the support of the Government especially Matrade by organising his own fashion show such as Aidilfitri Fashion Week – Syawalista KL, featuring the latest Hari Raya collection. Urban Box is starting from last year 2017, which business nature is event management with charity, ladies couture one stop solutions, and also a mobile apps for Fashion and Lifestyle which expecting to launching next year 2019. The Founder of Urban Box name (Jonathan), who is Managing Director of JK Prestige and also Co-Founder of Farel Mikhail Malaysia is creating this company Urban Box due to inspired by a Fashion and also to support empowerment women. This company also take a part to become Co-organizer with Farel Mikhail Malaysia, which the event name “Syawalista Fashion Week KL 2017”. The owner of this Urban Box believed that will bring this apps store into international market future.